Junk silver refers to coins that were produced as USA currency with certain percentages of silver content. The term Junk silver is a misnomer for this handy form of currency, as junk silver is based on the value of each coin’s silver content regardless of the design or face value. These coins are divided easily for use as currency and are a popular way to invest in silver. Junk silver can be bought in large bags worth $1,000 dollars of face value, and all junk silver coins are also readily available through circulated coins, banks, and many other outlets. These coins are usually in poor condition or have been circulated and worn. Most junk silver is made from 90% pure silver. These coins include dimes and quarters from 1964 or earlier. Silver dollars dated between 1878 through 1935 also contain 90% silver, but cost more due to their collectable status and popularity. In an economical breakdown, junk silver coins are easily used. The smallest unit, a dime, contains 0.07234 troy ounces of pure silver. Silver bars produced as 100 ounces or even as small as one ounce, cannot be divided, or used like coinage. Although the current market price of silver may be higher at time of use, these junk silver coins can be used at face value in the least. Silver will likely never go below the face value of junk silver coins, and at the best, will be worth 10x or more than the intended currency amount. Junk silver came about after the United States Coinage Act of 1792 created a standard for silver coins that required a composition of 1,485 parts pure silver for each 179 parts of copper alloy. This resulted in 89.24% silver and 10.76% copper. 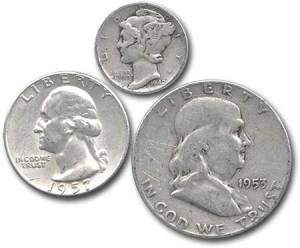 Half dollars dated pre-1965 are made with 90% silver, nickels from 1942 to 1945 contain 45% silver, and the Jefferson Wartime nickel contains 35% pure silver. When purchasing junk silver, the most valuable are the coins with 90% silver content. Junk silver with lesser amounts of silver will muddy the worth as the other metal content makes it less valuable and more difficult to sell for the silver content. The best way to buy junk silver coins is as a “face value bag.” A bag of junk silver can be purchased with $100, $500, and $1,000 dollars worth of circulated US Roosevelt dimes, Washington quarters, and Franklin and Kennedy half dollars. All the coins will have varied dates, but consumers need to know which dates include the 90% junk silver so they don’t become victims of fraud. Often, bags of junk silver can be bought “below” spot prices at the time of purchase. Junk silver has long been the lowest premium choice for investing in physical silver. This investment allows consumers to buy the greatest amount of pure silver at a manageable price according to their budget.